This entry was posted in Community, General News, Students and tagged engineering, football, Office of Technology Transfer on November 20, 2013 by Wire Eagle. AUBURN UNIVERSITY – Auburn University mechanical engineering students in Professor David Dyer’s comprehensive design class take good ideas and help turn them into sleek, customer-ready products. Interestingly, the good ideas can be generated at the most unusual times. 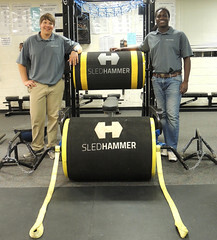 One idea, now a finished product called the SledHammer, originated when a high school football coach helped his neighbors remove debris from their yards after the April 2011 tornadoes ripped across Alabama. Vaughn Maceina, now a strength coach and teacher at Auburn Junior High School, was living and coaching in the north Alabama town of Guntersville. This entry was posted in Academic achievements, Faculty and tagged engineering, sec, Southeastern Conference on April 10, 2013 by Wire Eagle. AUBURN UNIVERSITY – Auburn University and the Southeastern Conference announced today that Professor Pradeep Lall of the Samuel Ginn College of Engineering has been honored with the SEC’s Auburn University Faculty Achievement Award for 2012-2013. 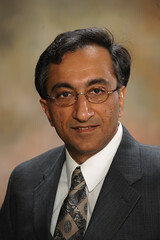 Lall, the T. Walter Professor of Mechanical Engineering and director of the Center for Advanced Vehicle and Extreme Electronics at Auburn, will receive a $5,000 honorarium, and he becomes Auburn’s nominee for the SEC Professor of the Year, who will be selected from 14 nominees representing SEC universities. This entry was posted in Academics and tagged engineering, minor, science, tribology on June 20, 2012 by Wire Eagle. AUBURN – Auburn University’s Samuel Ginn College of Engineering is adding a 15-hour tribology and lubrication science minor to its curriculum this fall – the first of its kind. The minor will prepare students from various engineering and science programs for careers that require a background in tribology, the study of friction, wear and lubrication. Tribology has a range of applications, including engines, manufacturing, power generation, human joint replacement and oil product chemistry. Students will gain an understanding of common mechanical systems and applications that rely heavily on satisfactory tribological performance, said Robert Jackson, director of the minor and a faculty member in the Department of Mechanical Engineering. They will get an inside look at the industry through tours of local manufacturing facilities and guest lectures from field experts and will gain hands-on experience with industry standard devices and equipment through laboratory sections and research. This entry was posted in Faculty, Research and tagged engineering, fulbright on June 6, 2012 by Wire Eagle. AUBURN – Alice E. Smith, faculty member in Auburn University’s Department of Industrial and Systems Engineering, has been awarded a Fulbright grant to teach and conduct research at Bilkent University in Ankara, Turkey, next spring. Smith, whose research and teaching involves modeling and optimizing complex systems, will instruct a series of courses on adaptive optimization and advanced modeling to Turkish graduate students in technical disciplines, including engineering. She also plans to focus her research on gender issues related to engineering academia, for which she has been awarded several National Science Foundation grants. This entry was posted in Community, Students and tagged engineering, water purifier on February 2, 2012 by Wire Eagle. AUBURN – Auburn University engineering students are preventing water-borne diseases in impoverished countries throughout the world with two portable water purifying systems they developed. Grant Moore, a senior in the Department of Electrical and Computer Engineering, and Business-Engineering-Technology classmates Lauren McManus, Grant Martin and Sara Yousey decided to develop the water purifiers for a class project that required them to create a business plan and model product. They developed two products: one called the Advanced Liquid Purification System, or ALPS, and the other, the Salt and Light purifier. Both utilize chemical processes approved by the U.S. Food and Drug Administration to eliminate viruses, bacteria and protozoa by dissolving a small amount of salt in water – or a pinch per pint. Electricity then passes through specially coated electrodes in the water, interacting with the dissolved salt to produce chlorine compounds that sanitize the water. More salt can be added to create a strong disinfectant. This entry was posted in Faculty, Research and tagged engineering, grant on November 3, 2011 by Wire Eagle. AUBURN – The Office of Naval Research in the U.S. Department of Defense has awarded a $3.2 million grant to Auburn University’s Center for Microfibrous Materials Manufacturing to study and develop advanced air filters for fuel cell systems. The center is housed in Auburn’s Samuel Ginn College of Engineering. Bruce Tatarchuk, the center’s director and a faculty member in the Department of Chemical Engineering, said that the focus of the research is to enable fuel cell systems to better meet the needs and environments of Navy ships. He said contaminants found in the air on these ships, such as soot, smoke and products of diesel combustion, could damage the electrodes that exist inside a fuel cell system.